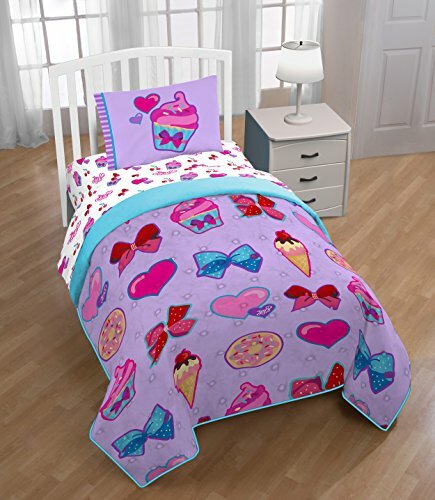 Enjoy the beautiful design of this JoJo Siwa bed spread, perfect for any childs room this bold and colorful bedspread is soft and comfortable for comfy cuddling. Enhances any bedroom decor, this bed spread is truly artwork for your bedroom. Coordinating bedding and accessories sold separately. Measures: 64" x 86". Easy clean machine washable cotton. Mizone Audrina Polka Dot Comforter Set 3 piece - Children's Bedding - Abstract Circles in Bright Shades of Pink, Teal, Purple and Black - Twin/Twin XL: Size 66x90"; sham is 26x20"; decorative pillow is 18x10"